Not even Siri's voice-recognition capabilities can match the efficiency of jotting down a quick note on a piece of paper. 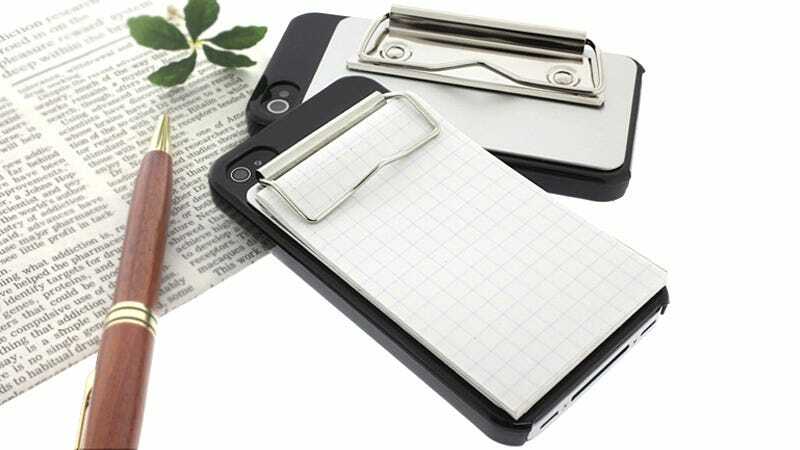 So we like this simple binder clip adorned iPhone case that keeps a small stack of paper close at hand. And besides protecting the back and sides of your phone, the case's clip is also handy for a myriad of other uses. You can use it to keep parking receipts handy, hold a stack of business cards, and even wear your phone on the end of a lanyard if you were worried that people weren't 100 percent sure you were a tool. It's just $25; let's hope they make an iPad version too, turning the tablet into an ultra-modern version of the classic clipboard.